Microsoft Nokia deal: why Stephen Elop chose Windows Phone over Android in 2011. 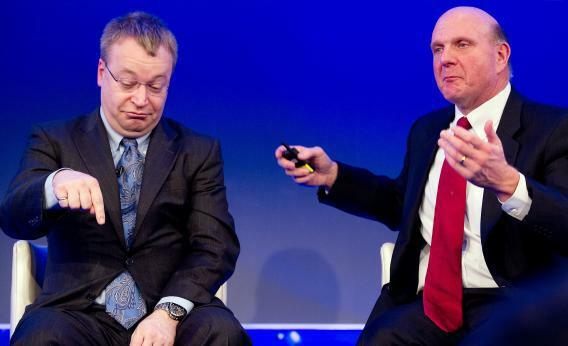 At a 2011 briefing annoucning Nokia’s parternship with Microsoft, then-Nokia CEO Stephen Elop (left) presciently indicates which way his company’s global smartphone market share is headed. In a famous 2011 memo, then-Nokia CEO Stephen Elop compared the company’s situation to that of a man standing on a burning oil platform. In Elop’s story, the man decided to plunge 30 meters into the freezing North Sea waters rather than remain on the platform and be consumed by flames. The oil rig was, of course, a metaphor for Nokia’s Symbian mobile operating system, which was getting burned by Apple’s iOS and Google’s Android. And so, under Elop, Nokia made a leap, ditching Symbian to focus on hardware. But when Elop jumped, he wasn’t diving into a blue ocean. Rather, he was faced with a choice between two other mobile operating platforms: Google’s Android and Microsoft’s Windows Phone. One of the platforms, Android, was more crowded, because it was already on a successful course. The other, Windows Phone, was lonely and adrift, but Elop had a good feeling about the crew. He had, after all, left Microsoft for Nokia just a few months earlier. In other words, Elop worried that Nokia would be just one among many interchangeable smartphone makers on the Android operating system—or, worse, that it would get squeezed out by a giant like Samsung. Partnering with Microsoft, on the other hand, would position Nokia’s smartphones as a true alternative to those on Apple and Google’s systems. About that, he was right. The problem: That differentiation turned out to be a negative rather than a positive. As Quartz’s Kevin Delaney points out, Nokia’s global smartphone share has plummeted from 34 percent in 2010 to a mere 3 percent in the first half of 2013. As a platform, meanwhile, Windows Phone has remained a distant third to iOS and Android, with the latter amassing nearly an 80 percent share of the global market. Acquiring Nokia’s smartphone business could help it gain a little ground, but as Google’s Vic Gundotra famously tweeted back in 2011, “two turkeys do not make an eagle.” Or, to put the metaphor in Elop’s terms: Nokia may have jumped from a burning platform onto a burning platform. Now, two years later, Nokia has been forced to jump again, while Elop is headed back to the mother ship, where some hope he can put out the fire. If not—look out below.